It may seem a little samey to start this year off with three craft related items but I had the next two things booked in already so that’s just the way the cookie crumbled. Plus it’s nice to start this exercise with a whopping great recommendation for an independent crafter like Ella from ‘This Is Pewter‘ (who has the patience of a saint and the skills of, well, someone very good at making things out of pewter). I went with a friend to this keyring making session at Kelham Island and it turned out to be a cracking way to spend a Sunday afternoon. I wasn’t sure about how successful this session would be for me because it’s safe to say I have very few design skills and sausage shaped fingers. The chances of me making a delicate item of beauty were slim. Fortunately I think rustic is still in. The first task was to draw out a design onto one side of a cuttlefish bone, and then scrape out a channel for the pewter to flow into. Wanting to represent my kids in some way I started with the idea of making a bug but disregarded this early on due to the need to make spindly legs – no one wants a three legged ladybird keyring. In the end I went for a treble clef (as both kids are pretty musical)and I thought this would be straightforward until Ella mentioned I needed to draw it in mirror image. Doh. My brain hurt. Beside me my friend was drawing out a beautiful hare with actual features – stunning. But at least she didn’t have to draw it backwards. 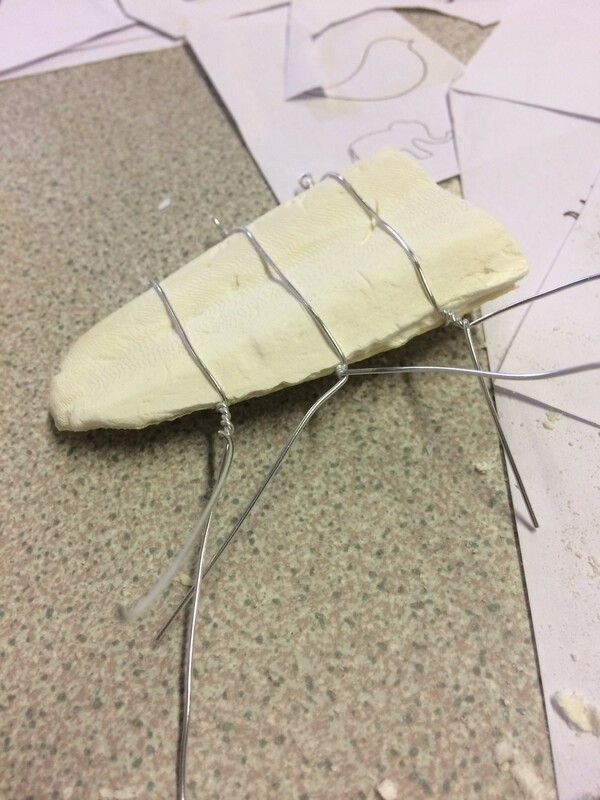 Once we’d cut out the channel and made a funnel the pieces of cuttlefish were joined back together with silver wire. Gorgeous, heavy, melted pewter was poured into the small hole. I felt like an alchemist for a few moments. A few minutes of patience and “ta da!” – not only was it in one piece it was almost sort of all the right way round. It was a pewter miracle. A bit of sawing, filing and polishing later and I’d created something recognisable! Of course it’s more than doing something you’ve never done before, it’s meeting a talented friendly artist and spending mindful time with a friend. Slowing down for a few hours and focusing is good for the soul. Of course the joy of the activity was more than doing something I’d never done before. It was meeting a talented friendly artist, learning something and spending mindful time with a friend. Slowing down for a few hours and focusing is good for the soul.